A kickstarter project by the cheekily-named Pirate3D is offering "The Buccaneer", its very own 3D printing device, for a mere $447 ($397 pledge + $50 S/H). This is far less than commercially available alternatives, but boasts specs on par with Makerbot's Replicator 2 which retails for over $2,000. In a nutshell, 3D printers transform special raw materials (usually a plastic polymer) into a three-dimensional object by printing very thin sheets of the material layer by layer. The printer determines how to best create objects like toys, cups and parts by analyzing downloadable 3D models of those objects. The prototype combines a CoreXY mechanical system with a Sanguinololu print controller and a Raspberry Pi, keeping costs low. 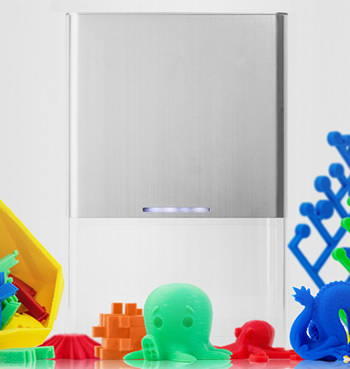 Pirate3D also added Wi-Fi capability and cloud-based printing to help separate it from competing 3D print systems. The Buccaneer's metaphorical sausage-making is concealed underneath a minimalistic brushed-aluminum box that looks like it was left behind by visitors from the future. A $12 spool of raw filament loads into the top and items are printed on a tray which lowers to the bottom upon completion. The highly-successful kickstarter campaign had set a goal of $100,000. However, more than 1,460 backers have pledged a total of $560,000 at the time of this writing. The campaign still has about 25 days remaining. Depending on your donation, printers will ship between the end of 2013 and the first half of 2014. 3D printers have created quite a buzz in recent times. While the technology matures, individuals, companies and governments have been grappling with 3D printing's disruptive potential, like its possible use in duplicating commercial items or even weapons using freely-available schematics.